Hello and welcome to exampundit. Today we are sharing a set of Reasoning Quiz on Puzzle for upcoming SBI PO Mains 2018 exam. The following set of questions contains 2 Hard Level Puzzle with 10 Questions to answer and a total of 12 minutes. Eight jokers- L, P, Q, M, R, S, T and N are seated around a circular cell not necessarily in the same order. All of them eat a different food item i.e. chocolate, pizza, burger, sandwich, cake, pasta, ice-cream and samosa, again not necessarily in the same order. They are facing the centre. They all are from different places and one of them is from Delhi. The one who eats burger is seated opposite to the one who eats sandwich. Person from Lucknow is seated opposite to the person from Mumbai. The one who eats samosa is three places away to the right of the person from Pune. M is from Kolkata and the person who eat pizza and pasta are his neighbours. The one who eats sandwich in neither a neighbour of the person from Pune nor the person who eats samosa. N eats chocolate and is opposite to the one from Hyderabad. P eats cake. N is not a neighbour of the one who eats burger. R is third to the left of the person who eats pasta and doesn’t eat samosa. Q is second to the right of the person eats pasta. T is from Odisha and is seated opposite to the person from Bangalore. 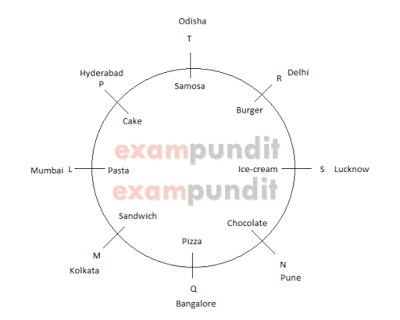 L is not from Lucknow and the person from Lucknow eats ice-cream. 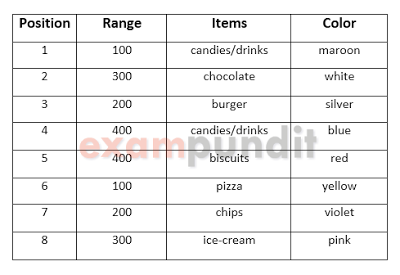 Question: Who among the following eats ice-cream ? Question: Who sits three place away to the left of L? Question: P related to Q, in the same way M related to S. Then in the same way who is related to the person from Hyderabad? Question: Which combination is true ? Question: Who sits opposite the person from lucknow? Eight boxes of different colors i.e. Yellow, red, pink, violet, white, blue, maroon and silver are kept one over the other, not necessarily in the same order. They contains different food items i.e. Pizza, chips, burger, chocolate, drinks, ice-cream, biscuits and candies. Two boxes belong to price ranges 100, 200, 300 and 400 each. The box of blue color is three places below the box of maroon color. The two boxes in the middle belong to 400’s range. The box of yellow color is just above the box which contains chips. Pizza and biscuits box are adjacent to each other. One of the box of price range 200 is in violet color and is not kept on the top. Color of burger’s box is silver and it is on third position from the top. Pizza and biscuits boxes are kept neither on top nor on bottom. The two range 300’s boxes are contain chocolate and ice-cream. Pizza’s box is kept third place from the bottom. The ice-cream’s box which is not of red color is kept just below the chips’ box. One of the range 300’s box is kept between range 100’s and 200’s box. There are three boxes between the yellow and the white colored box. The color of drink’s and candies’ boxes are not red. Pizza’s box belongs to 100’s range. Question: Which box is placed three places above the box of violet color? Question: Boxes of the 200’s range ? Question: Which box is kept three places below the maroon color box? Question: What is the range of burger’s box? Question: Which box is of 400’s range?